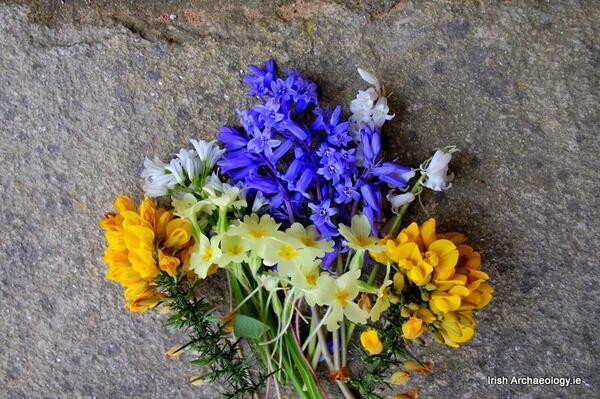 In Ireland Mayday is surrounded by a rich folklore tradition, most of which dates from 19th century. These beliefs give an insight into the mindset of a earlier, more rural Ireland where the spirit world and superstition still prevailed. While archaeologists are mainly concerned with the physical remains of past cultures, folklore can help us understanding how some of these people thought and why they carried out the actions they did. A particularly common tradition involved driving herds of cows between two bonfires in the belief that this would purify the herd and also bring luck. It was also deemed unlucky to give away salt, fire or water on Mayday as the luck and profits of a farm went with these gifts. Witches and the fairies were also believed to be unusually active during this period and a number of actions could be taken to protect your home and especially your livestock. Milk could be poured across the threshold of the house or byre to prevent entry by the ‘wee folk’ or more gruesomely the cattle could be driven to the nearest ringfort or “fairyfort” and some of their blood spilt on the ground to appease the spirits. Ringforts are the classic early medieval settlement type and were long abandoned by the 19thand 20th centuries when they had become associated with the fairy folk. I came across a piece by Willie Wilde (father of Oscar), many moons ago so I can’t remember it precisely, who recorded a blood-letting ritual in Roscommon during the 19th century. It was associated with some large enclosures in the Rathcrogan complex. Is this the same source you are using for your piece or another one? i am from the woods and oarks family one quarter irish and would like to know more!! That was probably in the Carmina Gadelica, a 19th century folklore collection by Alexander Carmichael. It’s available to read on line. We still practice this tradition every year here, in the breton speaking area of Morbihan/Bro-Gwened, Brittany. We do place. If you have ever been in the area around Vannes on the first of May, you will have seen the countryside decorated to celebrate the start of the new season. From the banks of the Lac de Guerlédan to the gates of the city of Vannes itself, houses, farm buildings, gardens, fields, and even beehives are adorned with the May Branch. This tradition is particularly alive such places as Kerfourn, Locminé, Baud, Bubry, St Jean Brevelay, Grandchamp and Belz but it can also be seen in Langoëlan, Perret and Lescouët-Gouarec. In fact it has survived in most the Breton-speaking communities in the Vannes region (Morbihan) – down to the coast, and even onto some of the islands. The custom does not seem to have ever spread eastwards into the Gallo-speaking areas and it is not clear to what extent it was ever practised further to the west, into Cornouaille. It would be interesting if readers could provide information about where they see it practiced. Anyway, in the evening of April 30th, before sunset, people make a point of hanging a beech branch, or, less commonly, a birch branch*, by their front door or on their shutters, or to plant it somewhere on their land. Everyone has somewhere where they can hang a ‘May Branch’, and in some places, such as Silfiac and Grandchamp, part of the tradition is for an old man or woman to make a tour of village to inspect the May Branches. 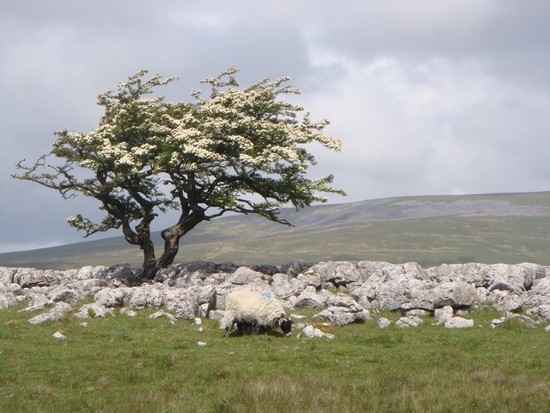 (*) On the coast and on the islands, where it doesn’t grow, beech is replaced by a branch of flowering white hawthorn. Some people fix the May Branch to their post box to keep off bad news, others put on their car to prevent accidents and beekeepers often place a branch on their beehives. Farmers believe that the tradition helps to protect livestock from disease and to prevent the drying up of springs and water wells. Often, people say that the Branch of May “prevents toads from entering the house”, which is not very polite to these harmless amphibians which are so useful in the garden. It is possible, however, that it is a tradition derived from the druidic festival of “Beltane”, dating back to pre-Roman times. 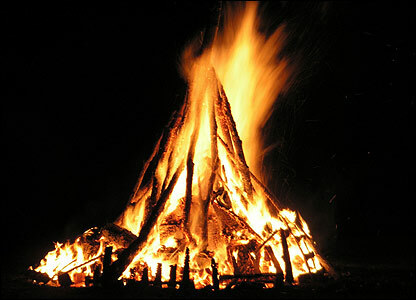 In Celtic mythology Beltane is the most important celebration of the year after “Samhain” (Halloween). Indeed, the Celtic calendar had only two seasons, and May 1 was the first day of summer – the first day of the ‘season of brightness’ that would run until the Samhain (November 1st), the first day of the ‘season of darkness’. The “Branch of May”, beech, birch or hawthorn could be a symbol of renewal, fertility, love. Its current use might suggest that it is also a means of purification and protection, according to Celtic symbolism. On May 1, my grandmother and her seven sisters rose before dawn and, without speaking a word, went outdoors. The youngest would fall asleep on the way down the stairs, so they took along an alarm clock to wake her, since it was essential that no one say a word. Then they washed their faces in the morning dew. I’m fairly sure this was so they would be beautiful (and they were!) but I wonder if there was lore about finding a husband that I just don’t remember. All this was happening in America, in a small city, where enough dew may have been hard to find. Does anyone know of this custom In Ireland? Yes it was still taking place my mother and her mother would wash there faces in the early morning due on the 1st of May in rural Leitrim circa 1940s. Also placing flowers outside the front door which my mother still does to this day. Hi.was just reminding myself of some of my parents customs. I always wash my face and walk barefoot in the May morning dew. My mother who is in her 80s says all women and girls used to do so. It is meant to give one eternal youth and aid in the search for a husband. It was a tradition in many parts of rural Scotland up to the 1930s. Its still celebrated in Arklow, co wicklow. Be great if it was like the Edinburgh Fire Festival.